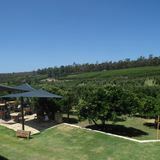 Nestled within a beautiful valley in Pickering Brook, just over thirty minutes from Perth is a cider house like you have never seen one before. With breathtaking views of the 40 acre orchards, The Core is the perfect place to sit, enjoy and unwind with friends on the weekend. Open from Thursdays to Sundays, the Core offers restaurant quality meals, "bar snacks", refreshing ciders and wines, homemade ice cream and sorbets and fresh juice made from the quality produce they have growing in their very own orchards. The staff are more than accommodating, taking you to your tables and waiting on you hand and foot. For the people who enjoy a good "Sunday Sesh" The Core is open from 3 until 7, also offering wood fired pizzas from a local pizza maker in his very own "pizza van". Sit up on the deck or grab a blanket and sprawl out on the grass and just take in the atmosphere. I have one suggestion though, it can get pretty chilly late in the afternoon, so maybe bring a jacket or two to keep snuggly! So if you are looking for a casual weekend catch up with delectable food, stunning views and local service, The Core is the place to be this weekend! Take it from me, a Core regular!